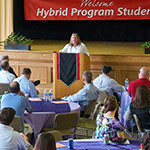 Students take a required introductory course and then choose from the law school’s J.D. courses. Tutors are available for LL.M. students. LL.M. students may apply through the Law School Admissions Council (LSAC) website or by paper application submitted directly to the law school. Proof of competency in English. Applicants from non-English speaking countries or whose native language is not English must provide proof of English competency. This may be by means of an official TOEFL score report, IELTS score report, other established test of English, or successful completion of an English language program. Applicants may also be invited to demonstrate English competency through an interview. Two letters of recommendation, in English, submitted directly from the recommender to LSAC or Mitchell Hamline. Who should consider applying for the LL.M. program? Mitchell Hamline’s LL.M. program is designed for foreign lawyers and law faculty who seek to learn American substantive law and receive an in-depth understanding of America’s legal system and practice of law. The LL.M. degree is especially attractive to lawyers who expect to work with American trained attorneys on international transactions or disputes that involve American law and legal institutions. This includes lawyers who 1) represent clients with interests in the United States or 2) have American clients with interests in the lawyers’ home countries. For faculty, the LL.M. 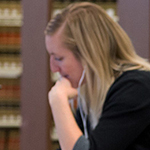 program offers the opportunity to learn American substantive law and receive important grounding in the case law method and legal reasoning process which characterizes the common law tradition. Faculty will also have the opportunity to participate in many of Mitchell Hamline’s innovate teaching and curricular initiatives. 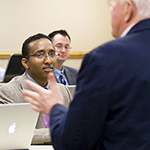 Increasingly, a master of laws degree from an American law school is seen as an important credential for professional advancement in many educational institutions. The LL.M. degree is not intended to qualify foreign lawyers to take the bar exam or to practice law in the state of Minnesota. Although the LL.M. degree may enable students to take the bar exam in other states, it is the responsibility of any student who may be interested in practicing law in the United States to research and understand the requirements of doing so. Do my transcripts need to be translated into English? Yes, please ask your university to translate your academic transcripts into English. If your university is unable to translate your transcripts, please use a certified translation service, such as the LL.M. Credential Assembly Service provided through the Law School Admission Council (LSAC). What is a “credential evaluation”? In order to evaluate all applicants on a uniform basis, we require all LL.M. applicants to have their transcripts/grade reports evaluated by an independent company, such as LSAC, WES, or ECE. These evaluation companies translate the information into English as well as provide us with your U.S. grade equivalency. If possible, always request a course-by-course evaluation which lists each individual university course and the grade received. What is the LL.M. Credential Assembly Service and should I register for it? Mitchell Hamline will accept applications through the Law School Admission Council (LSAC) or submitted directly to the institution. If an applicant applies through LSAC, LSAC collects and authenticates the academic records and TOEFL scores of international lawyers who are applying for admission to U.S. LL.M. programs. This is an easy way to collect all of your application materials in one place and obtain the credential evaluation with the same company. To register for the service or receive more information, go to llm.lsac.org. Please supply recommendation letters from knowledgeable persons who can tell us about your academic qualifications and career interests. If possible, please include at least one academic reference. Am I required to declare a specialization when I apply? No. Mitchell Hamline does not require its LL.M. students to take a specialized LL.M. program or have a specific focus for their LL.M. degree. Students can design their own LL.M. program. There are no specific courses that LL.M. 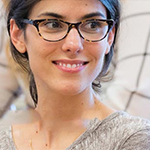 students are required to take, other than the Introduction to the Legal System of the United States course. This means that students have the flexibility to create their own programs and put together course and seminar schedules that reflect certain practice specialties that are of particular interest to them. Does completion of the LL.M. degree qualify students to take the bar exam? The LL.M. degree is not intended to qualify foreign lawyers to take the bar exam or to practice law in the State of Minnesota, although it may enable students to take the bar exam in other states. Each state has its own regulations regarding qualification to take the bar exam. Students should do their own research regarding these regulations. The National Conference of Bar Examiners publishes a yearly guide with bar information of all individual states and additional details. If you are interested in taking a bar exam in the United States, we recommend you research these regulations before you enroll in any LL.M. program. Ann L. Gemmell, M.A., J.D.